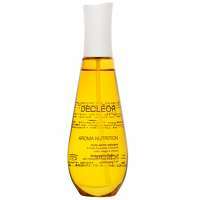 DECLÉOR AROMA NUTRITION Satin softening dry oil with FRANKINCENSE Essential Oil 100ml, a versatile dry oil for body, face and hair. A light and non-greasy dry oil to soften and smooth skin, scented with a subtle, delicate and beautifully feminine fragrance. The softening dry oil leaves your body and face feeling softer and more comfortable, your hair nourished and looking shiny. Enriched with Frankincense Essential Oil to relieve stress and anxiety and boost the skin, Camellia Oil and Rose Oil to moisturise and keep hair and skin supple, and Sweet Almond Oil to smooth and promote healthy skin. Active Ingredients: Frankincense Essential Oil, Camellia Oil, Rose Oil, Sweet Almond Oil. Skin Type: Normal Skin, Dry Skin. Paraben-Free, Preservative-Free, Mineral Oil-Free, Colourant-Free. DECLÉOR AROMA NUTRITION Satin softening dry oil with FRANKINCENSE Essential Oil 100ml was found on 6 websites and was price compared using EAN: 3395014460009. The cheapest DECLÉOR AROMA NUTRITION Satin softening dry oil with FRANKINCENSE Essential Oil 100ml is shown as the main item, prices range from £23.75 to £37.00, excluding delivery. Price comparison based on price and delivery charges, with any valid discount codes being applied, is shown in the table above. Prices and information correct at the time of publication.